Charlie Palmer’s Dry Creek Kitchen Restaurant in Healdsburg, California. Please contact Richard Sheppard at Richard@Artstudios.com for purchasing information. I love the sky, I so want to be in that cafe! Thanks Ashley-May! It’s actually a real restaurant here in Healdsburg, CA. It’s called Dry Creek Kitchen and it’s very good. I’ve eaten there a number of times. It’s owned by Charlie Palmer who also owns the restaurant Aureole in NY and Las Vegas. 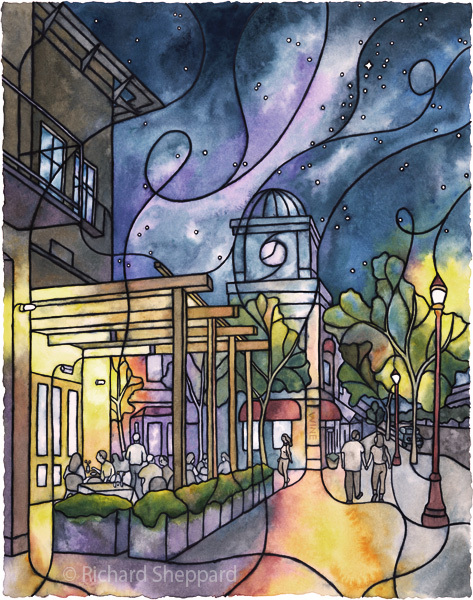 I work for the Charlie Palmer Group and we love this illustration of our Dry Creek Kitchen restaurant! Thank you for portraying our restaurant so beautifully! Would you mind if we shared the image with our customers on our social media sites? Love this! It has the apperance of stained glass to me. Such pretty colors too. Thanks Laurie! Yes, I think my style is similar to stained glass. I’ve had some stained glass artists comment that they could creates some of my illustrations in glass too but it’s never been done-yet! It reminds me of a stained glass window. Beautiful! Yes this does look like stained glass but softer. It’s beautiful. I’m sure you will soon have your own window which would be really cool!